It has become our grandstand fruit wine made from the sweetest Wilson Wonderful pomegranates grown just 70 miles east of Casa de Fruta in Madera, California. It's all pomegranates. No grape wine or fruit juice fillers. Drink it cold. Makes a great spritzer, just add some club soda and a twist. If you like Mimosas, you will love a Pomosa. 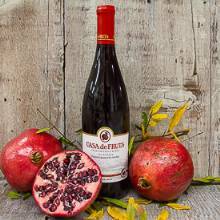 Just trade the OJ for Casa de Fruta Pomegranate Wine. Pomtinis are Absolutely great too. Gray Goose works too! From Couscous to Curry. Pomegranate wine pairs excellently with Mediterranean foods. Pomegranate Wine. Soft, sweet, smooth tasting, gourmet dessert wine with a hint of tartness. POMEGRANATE WINE has up to 3 times more antioxidants than red wine! For a refreshing treat, try it with club soda and a lemon twist. Our delicious Pomegranate Wine is made from Wilson Wonderful Pomegranates grown in our Madera, California orchard. Purchase 6 to 11 bottles and save 5% - Purchase 12 or more bottles and save 15%. Save even more by joining our Wine Club. NOTE: SHIPPING RESTRICTIONS APPLY. LIKE MOST FAMILY WINERIES, OUR PERMIT ONLY ALLOWS US TO SELL WINE TO AK, CA, FL (EXCLUDING LAFAYETTE, LIBERTY AND WASHINGTON COUNTIES), MN & DC. WINES MAY BE DELIVERED ONLY TO PERSONS WHO ARE AT LEAST 21 YEARS OLD. *Due to weather constraints, wine orders will be shipped on cooler days if temperatures exceed 80 degrees. Expedited shipping is also available at checkout. From Anonymous of Stanton, California on 6/9/2018 . From Carol of Fresno, California on 6/18/2017 . From Anonymous of San Jose , California on 5/29/2017 . From Renee of San Jose, California on 9/5/2016 . From Anonymous of soledad, California on 7/28/2015 . 1/21/2014 – Can you ship to Texas? If not, is there any way that we could somehow get some? My friend brought some when she last visited . . .
11/7/2013 – Can you ship to Washington state? If you can't ship to an individual, does your winery ship to any local Washington distributors? . . .
10/11/2011 – What percentage of alcohol is this wine and is there a Casa de Fruta in Connecticut?? Please advise, thanks! 7/9/2011 – does the wine come with the wine glasses? 6/10/2011 – Do the wine glasses come with the wine?